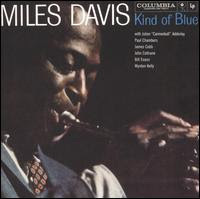 Pretty much everyone on the planet will site Miles Davis' Kind Of Blue (Columbia Records) as the most important jazz album of all time. But if you aren't truly familiar with it you won't really understand why. I hope in this entry that I can help explain. And, if you haven't purchased it already you will soon. Originally recorded in 1959 with John Coltrane (tenor sax), Julian "Cannonball" Adderley (alto sax), Bill Evans and Wynton Kelly (piano), Paul Chambers (bass) and Jimmy Cobb (drums), this is considered one of the fiercest, dazzling and romantic recordings ever made. One of the many things that makes Kind Of Blue a masterpeice is the pure fact this album was recorded in only a few hours. The delicate tension between the musicians is felt with every note. I don't mean tension in a negative way. I mean that each member works off of each other with almost a boxing like mentality ("I can do you a note better"). The piano work by Bill Evans is impeccable and unmatched. This is by far one of his highest moments on record. Cannonball Adderley and Paul Chambers are in fantastic form. The real star is the sometimes underrated Jimmy Cobb on drums; Jimmy Cobb is also the only surviving member of this historic recording and carries the torch brightly whenever he performs any song live or speaks about it in interviews. There have been various incarnations of this album since the advent of the CD. Most recently a super (and I mean super) deluxe version with blue vinyl, double CD & DVD, archival booklet and more, which is just about overkill. I would suggest sticking with the single disc if you just want the basics. There is a double disc version which includes some wonderful outtakes and a live version of the classic first track on the album "So What". I don't think its necessary unless you really are a true jazz fan. You should own any single disc version since 1997 (check the copyright date on the back of the inlay). The original masters were found earlier that year and the sound quality and little intricacies are much more noticeable on any version since 1997. For this reason I would suggest not buying a digital version online or a used version at a CD store. Take the extra cash and buy a classic album. You won't be disappointed. If you already own Kind Of Blue you will know most of this but I tend to believe not everyone does so I hope this finally convinces you. You hear some of the most legendary performers at the peak of their powers during one of the most historic moments in music history. Everyone says if you're going to start listening to jazz, Kind Of Blue is the album you need to start with. There really is no argument when it comes to this. For more proof check out this performance. I work with someone who says he's never heard Kind of Blue before. That just seems incomprehensible to me. How is it possible? It's so iconic. To many people who aren't into jazz Kind of Blue IS the sound of jazz. I remember the first time I heard it in college -- I instantly recognized it, though from where I could not say because my parents didn't own the album. It's just one of those albums that seems as natural and effortless as air itself.